If there’s one thing we can count on when it comes to superfoods, it is that there will always be new ones we can try. While kale, chia seeds, and acai berries were yesterday’s darlings, today, there are new kids on the block. That doesn’t mean the old ones should be off the list, though. As we know, the best healthy diet incorporates a variety of nutritious foods rather than just one or two special ones. It’s fun, though, to dig into those items that have the experts buzzing about easier digestion, boosted immunity, reduced allergies, and enhanced nutrient absorption. And who doesn’t like to shake up the dinner menu with a new recipe guaranteed to benefit everyone in the family? To that end, we gathered up the five new superfoods you can eat here. See if one of these tickles your fancy. If you’re tired of your usual almonds and cashews, take a trip back in time and get yourself some tiger nuts. Popular in the 1950s and 1960s as treats for young children, they look like nuts and have a sweet, coconutty flavor and a chewy texture. They’re not actually nuts in the strict sense of the word, though. Instead, they’re tubers (like potatoes) from a plant called the yellow nutsedge or Cyperus esculentus, which is actually considered a common lawn and garden weed in Missouri. Also called nutgrass or watergrass, it produces umbrella-like flower clusters, and reproduces by seed and underground tubers—the nutlets or nuts. Like other real nuts, tiger nuts are a satisfying snack. They contain “resistant starch,” a type that helps suppress the appetite, yet they’re nut-free and gluten-free, which makes them a great alternative for those with sensitivities and allergies. And that resistant starch, by the way, is also prebiotic, which helps feed those healthy probiotics in your digestive system. Rich in minerals like phosphorous, potassium, and vitamins E and C, the nuts are also frequently made into a flour that’s perfect for most baking recipes, and also can be added to smoothies for a bit of extra protein, fiber, and nutrition. Tiger nut milk is another popular form of this treat. You probably already know that regular garlic is really good for you. In studies, it’s been linked to a reduced risk of heart disease, cancer, and chronic inflammation, and has shown the ability to shorten the length of the average common cold. So what’s different about black garlic? It’s essentially the same thing, except that it’s gone through a fermentation process. While so-called “white” regular garlic is the “raw” form of the food, black garlic starts out as regular garlic and then is fermented in high temperatures and high humidity for about 30-90 days. The result is that the cloves turn black and become very soft. They also taste different, often described as sweet and savory, with a molasses-like flavor and tangy garlic undertones. The texture is more jelly-like, like a soft dried fruit. The composition of black garlic is somewhat different from the raw form, too. While one of the main nutrients in raw garlic is allicin, which has antimicrobial properties, black garlic doesn’t have as much, because it tends to be broken down during the fermentation process. Instead, black garlic is high in S-allyl cysteine (SAC), a sulfur-based antioxidant. In fact, in one 2009 study, black garlic was found to have a stronger antioxidant activity than regular garlic in animal participants with type 2 diabetes. One of the best things about black garlic for most people is that it doesn’t have the annoying odor. Finally, you can enjoy your garlic without worrying about bad breath. It works well in a variety of food applications. Add it to salad dressings, meat sauces, sandwich spreads, deviled eggs, soups, and pretty much anywhere you’d use regular garlic. It’s like a drinkable yogurt, and can be made from most any kind of milk, including cow, goat, sheep, coconut, rice, and soy. It’s said to have a tart and refreshing flavor like yogurt, and also contains the same beneficial probiotic bacteria. So what’s the difference between kefir and yogurt? They are made differently, for one. Kefir is cultured at room temperature, whereas yogurt can be cultured at room temperature or in heat, depending on the starter culture used. They also taste different—kefir is a bit more sour. The beneficial bacteria are slightly different between the two as well. Whereas the type found in yogurt helps keep the digestive track moving smoothly and sustains the friendly bacteria in the gut, they pass through the digestive tract. Kefir has a greater range of bacteria that actually colonizes (stays) in the intestinal tract. In fact, it’s said to contain about 30 different strains of bacteria and yeasts, making it a more potent source of probiotics. 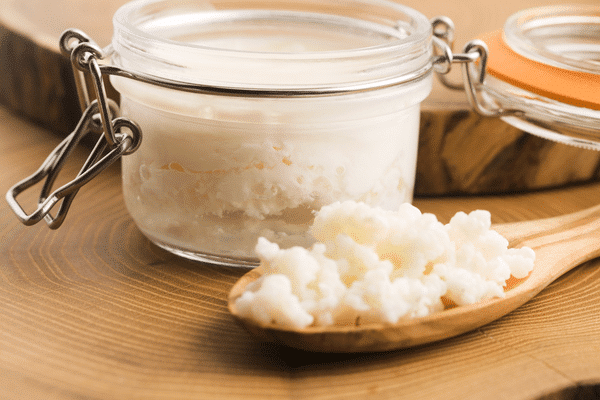 Kefir is a good source of magnesium, phosphorus, vitamin B12, calcium, folate, riboflavin, and biotin, as well as protein, but by far its claim to fame is its wide variety of probiotics. You can simply drink it as a refreshing beverage, or use it instead of buttermilk as a base for soups and stews, or in other recipes in place of sour cream, heavy cream, or yogurt. The root has a yellow, papery exterior and a creamy white interior similar to that of a raw potato or pear. The flavor is sweet and nutty, and the texture crunchy and juicy when raw, though you can cook it, too. It’s popular in soups and stir-fry dishes, and in similar forms to cooked potatoes, such as mashed and baked. It’s often served raw in salads, fresh fruit combinations, and cut into wedges and dipped in salsa. Jicama is rich in fiber and vitamin C, and has only 35 calories per 100 grams. The type of fiber it has is said to be ideal for diabetics, as it doesn’t spike blood sugar levels. Note: While the tuber is very good for you, the rest of the plant is poisonous! Obviously, this one is made from bananas—green ones, to be exact. They’re peeled, chopped, dried, and ground. Pretty simple. Traditionally, it was used in parts of Africa and Jamaica as an alternative to higher-priced grain flours. If you're gluten-free, you may have already heard about this, or you may already be using it, as it’s often used as a gluten-free replacement to wheat flours. In fact, the whole gluten-free craze is what’s responsible for the resurgence of banana flour, which can be used in place of wheat flour in pretty much any recipe, including those for sauces, soups, breads, baked goods, meat breading, and more. 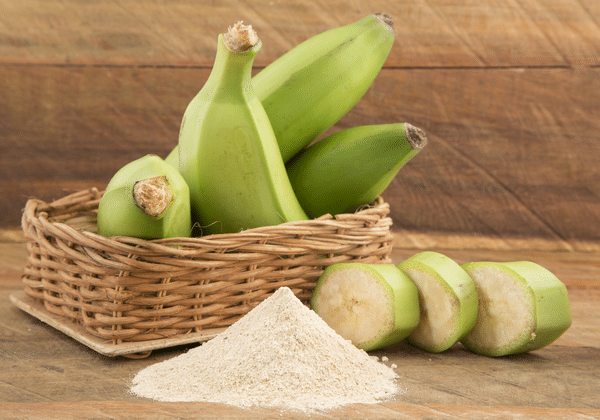 Because of the presence of the bananas, it has a mild banana flavor when raw, and a texture similar to lighter wheat flours. When cooked, the banana flavor is said to disappear, leaving behind an earthy flour taste. Another advantage—you can use less, because of the starch count. So if you’d use one cup of regular flour, you’d use only ¾ cup of banana flour. In addition to its gluten-free status, it also contains a resistant starch, which is a type of carbohydrate that acts like fiber. In other words, instead of breaking down quickly and spiking blood sugar levels as some carbs do, it actually digests slowly, keeping us fuller for longer and helping to stabilize blood sugar levels. Have you tried any of these five foods? 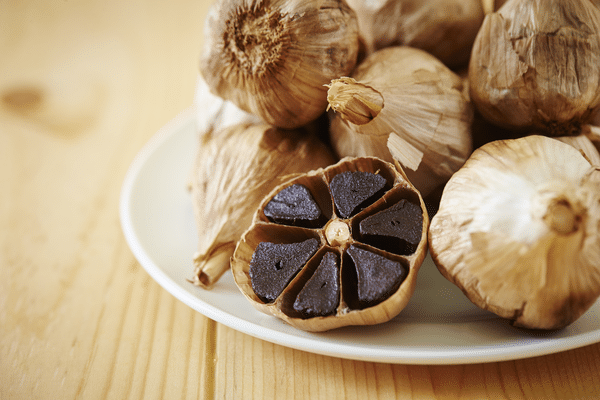 The Wall Street Journal – Does Aged, Black Garlic Work Better Than Regular Garlic? 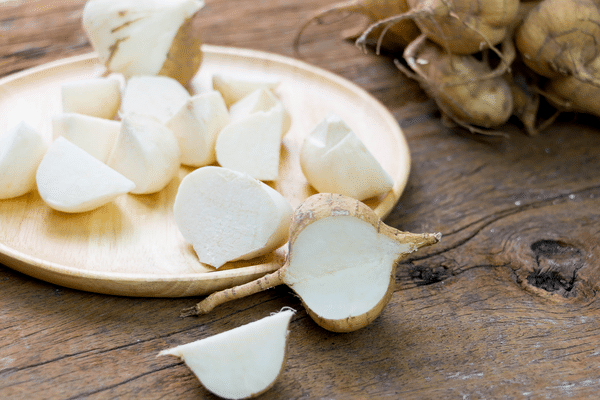 NY Daily News – Jicama: Is this root vegetable the next superfood? All terrific foods; especially jicama. The issue with it is finding organic, as in the 30 plus years that I’ve known about it, I have only seen it once being grown organically! I grew it in Hawaii back in the mid eighties, and it was the best I’ve eaten. Banana flour is lovely, as is tiger nut flour, both I’ve used in cookie batter. Kefir is easy to do at home, and Gem Cultures has an excellent product, as does Body Ecology. Black garlic is now being produced by Melissa Produce, but I’ve bought it locally here in Austin from an organic producer. It’s nice in a pesto! Bravo for all the great information..how about jungle peanuts, water kefir, white mulberries, and coconut/cassava tortillas? I’ve had cow and goat milk kefir. I’ve made cow milk kefir at home. I’ve also used jicama, dipped in hummus. 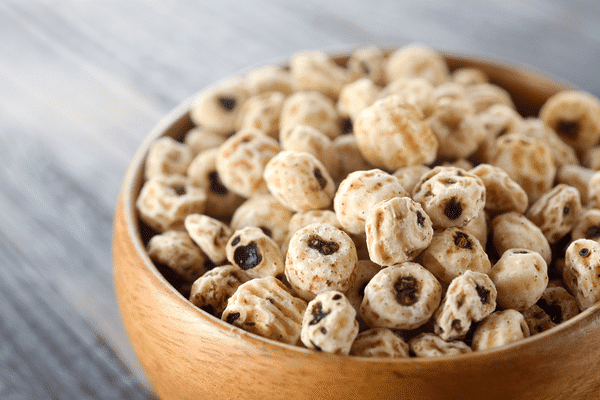 Where can you buy the tiger nuts, black garlic and banana flour? Whole Foods? Online only? I have tried jicama and black garlic. Jicama is something I go on kicks with…love the crunch and mild sweetness. I’ve traveled to Mexico a number of times and it’s pretty popular there. I like to dip it in guac. I didn’t realize it had so many health benefits. I haven’t tired black garlic on its own, but have bought ghee (the brand is Simply Ghee, and made with pastured butter) that was flavored with black garlic. Loved the flavor it added! I’ve only tried jicama raw & i liked the flavor & the crunch; just haven’t purchased it again. I like the idea of using it to dip instead of chips; think I’ll try it! The only other one I’ve heard of is kefir, but I always love trying new things if they’re not too expensive!